This model is a faithful representation of the published equations, but it is not compatible with any CellML tools. It contains the sum MathML element, which is not supported by PCEnv, OpenCell or COR, rendering further curation useless. Inspection of the model suggests that there are significant errors beyond the presence of the sum operator that would render it unsuitable for description in CellML. ABSTRACT: A Ca(2+) spark arises when a cluster of sarcoplasmic reticulum (SR) channels (ryanodine receptors or RyRs) opens to release calcium in a locally regenerative manner. Normally triggered by Ca(2+) influx across the sarcolemmal or transverse tubule membrane neighboring the cluster, the Ca(2+) spark has been shown to be the elementary Ca(2+) signaling event of excitation-contraction coupling in heart muscle. However, the question of how the Ca(2+) spark terminates remains a central, unresolved issue. Here we present a new model, "sticky cluster," of SR Ca(2+) release that simulates Ca(2+) spark behavior and enables robust Ca(2+) spark termination. Two newly documented features of RyR behavior have been incorporated in this otherwise simple model: "coupled gating" and an opening rate that depends on SR lumenal [Ca(2+)]. Using a Monte Carlo method, local Ca(2+)-induced Ca(2+) release from clusters containing between 10 and 100 RyRs is modeled. 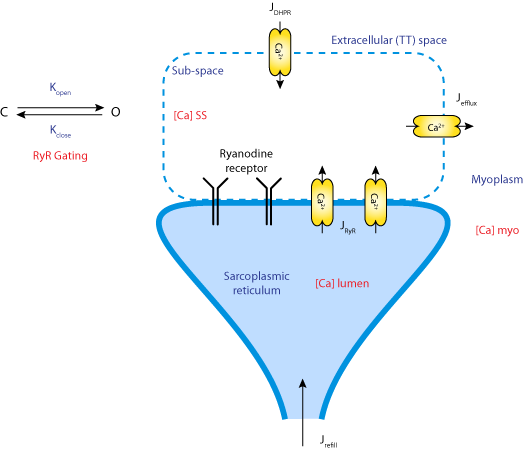 After release is triggered, Ca(2+) flux from RyRs diffuses into the cytosol and binds to intracellular buffers and the fluorescent Ca(2+) indicator fluo-3 to produce the model Ca(2+) spark. Ca(2+) sparks generated by the sticky cluster model resemble those observed experimentally, and Ca(2+) spark duration and amplitude are largely insensitive to the number of RyRs in a cluster. As expected from heart cell investigation, the spontaneous Ca(2+) spark rate in the model increases with elevated cytosolic or SR lumenal [Ca(2+)]. Furthermore, reduction of RyR coupling leads to prolonged model Ca(2+) sparks just as treatment with FK506 lengthens Ca(2+) sparks in heart cells. This new model of Ca(2+) spark behavior provides a "proof of principle" test of a new hypothesis for Ca(2+) spark termination and reproduces critical features of Ca(2+) sparks observed experimentally. Layout of the model elements. Derived from workspace Sobie, Dilly, Dossantoscruz, Lederer, Jafri, 2002 at changeset 5f5f397174bd.